I had every intention of penning a verbose message this Thanksgiving, but the immobilization caused by the tryptophanic residue in my bloodstream has currently hurled me inexorably couchward. I wanted to say a lot today. I am sure that some of you are more than tired of me and my vapid, but cheerful(! ), blog posts, and while I’m sorry you’re bored, you must surely have a cold, shriveled little heart that cannot tolerate my gratitude! I feel like I have a lot to be grateful for, like my amazingly loving and supportive parents who, even though I packed up an moved 1,600 miles away, still love me just like I was sitting in their house being the demanding princess I can occasionally be. 🙂 I am grateful for being able to live in Canada and, while I know I won’t be here forever, I have fallen in love with this beautiful country and its fantastic peeps — I wouldn’t trade a single, solitary moment of my time here and will always say only excellent things about the country, even when they continue making fun of my accent. 🙂 But what I really wanted to do today was to show some love to YOU, my blog readers. You, the people who take the time to stop by here and read my drivel, to leave comments, to send emails, and reply to tweets. Those of you who stop by, lurk, and say nothing at all. When I started blogging a few years ago, I loved it, but did it really just for myself. I never took it seriously. Then people actually started finding me and reading me, and I had no idea that my site would grow into a community of people I love and treasure—not just online, but offline, too. My blog friends have sent me some of the nicest emails I’ve ever received. They have encouraged me in the midst of relationship issues, the ending of friendships and worries about my future. They have made me laugh and cry all at the same time. Some of them have crossed the line from “e-friends” to just plain friends. Friends I speak with regularly, friends I can’t wait to see again. Friends who fill my email box, my Facebook wall, and my snail mail box with love and care and friendship. Blogging has reconnected me to old friends and to people I had no idea were reading or paying attention. It has opened my eyes to people and alternate points of view points and goals and books and careers and ideas and plans. And for that, I can never write an adequate post. So, if you’re here, on this page, I just want to say Thank You. I am thankful for you. I am grateful for all of the little things, with seemingly insignificant moments that make my life so much sweeter. 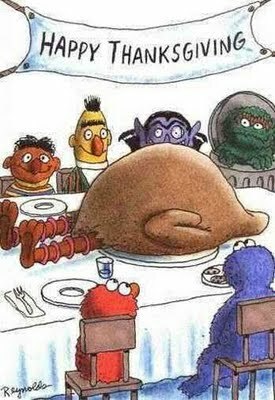 I wanted to say all that, but all I can really manage at this moment is a giant Happy Thanksgiving to everyone! I love, and am so thankful for, you all! “You might want to get down on your knees and thank your lucky stars you’re in Texas”, goes the saying. I don’t disagree with its authors, whoever they are, but I’m pretty thankful I’m in Canada, too. Of course, I had yet to experience a true Canadian Thanksgiving, so I couldn’t yet fully comment on all-things Canadian. I was working away recently, when an IM popped up from my friend Chris (also known as my Official Canadian Tour Guide*). “What are you doing on Monday?”, he asked. I thought for a second and then replied, “Um, filing my nails and doing laundry. You know, all the exciting things I normally do on a holiday Monday”. (You know you are so jealous.) “Nope”, he said, “you’re coming to our house for Thanksgiving”. I practically danced out of my chair. I was so psyched! I couldn’t wait to compare a real Canadian Thanksgiving to the large, austral, Southern Thanksgivings to which I was accustomed. Would we have back bacon casserole? Maple syrup sugar pie? Poutine-stuffed turkey? Do they even have turkey at Canadian Thanksgiving? These are the things to which I was seeking answers. Answers which I would be happily gleaning via my eyes and, more importantly, my stomach. While it may seem like Canadian Thanksgiving is simply an attempt to add to an already-bloated list of statutory holidays, in reality, Canada celebrated their “day of thanks” well before the Americans did — 43 years before, to be exact. Surely it doesn’t matter who celebrated first and really, who could have known? I mean, did the French and the Brits in Canada send down a fax to the pilgrims in America saying “hey, we got here about 40 years ago and when we did, we had this big day of thanks complete with cornucopias, turkeys, parades and pumpkin pie!”? Doubtful. As I understand it, the only real difference between the American holiday and the Canadian holiday (incidentally celebrated in October**) is that for which each respective country is giving thanks: Americans celebrating the arrival of the pilgrims to the new land (and subsequent plundering of it), with Canadians giving thanks for a successful harvest. And no, not an ice harvest. Thanksgiving Day turned out to be blustery and cool this year, and I listened to my boyfriend, Ira Glass, on This American Life, as I prepared my contribution to the day — sweet potato casserole, complete with marshmellows on top. Delish! By the time I arrived for dinner, things were in full swing. The house smelled of roasted turkey (I guess they have turkey at Canadian Thanksgiving, after all), brussels sprouts, cinnamon, and, most importantly, fresh pumpkin martinis. Yes, please! The party was small, with eight adults and two adorable children, but perfect, nonetheless. You know how holidays like Thanksgiving and Christmas bring out what I like to call the “extended family crazies”? Like crazy Uncle Al who wants to show you the wart that he removed himeslf or loopy Aunt Edna whose wig looks like it may actually still be alive? Well, there was none of that at Chris’s — just good conversation***, amazingly delicious food, and lots and lots of thanks. We had Canadian-raised turkey with stuffing, roasted carrots, brussels sprouts, sweet potato casserole (natch), salad, and fresh Ontario beets. Dessert was fresh pumpkin pie, apple pie, and a homemade Austrian dessert into which I could have put my face. Combined, it was all like a big party in my mouth. As years go, this has been a more challenging one for me. Still, I have so much gratitude for what I have and so little concern for what I don’t, that I don’t feel like I have any right to waste any time wallowing. You’ll still find me on my knees thanking my lucky stars I’m from Texas, but, while I’m down there, I’m also thanking the universe that I got to experience a true Canadian Thanksgiving. * Chris is a walking encyclopedia of all-things Canadian. His brain is basically like Frommers Canada, so luckily, I’ve never actually had to buy it. ** It’s celebrated in October because that’s when the seasonal harvest is, yo.